People use their GPS apps, cameras, and mobile internet to navigate strange cities in search of good coffee, record “selfie” commentary while they wait in line, and upload their videos directly to social media sites while they sip their latte. But no amount of high-tech savvy can save a well-loved device from dying when its battery is drained. Smartphones suffer from the same basic ailment that plagues solar power plants and wind farms – they lack cheap, reliable, long-life batteries to store large amounts of energy for when the sun goes down, the wind stops blowing, or the device is unplugged for a long time. “I think almost any application in technology you can think of is currently limited by the battery,” said Amy Prieto, a chemist at Colorado State University who leads a start-up company with the goal of developing a better energy storage device. The group is nearing the prototype phase for a lithium ion battery that should be safer, cheaper, faster-charging, and more environmentally friendly than conventional batteries now on the market. She will present her latest results at the upcoming AVS 60th International Symposium and Exhibition, held Oct. 27 – Nov. 1 in Long Beach, Calif. Batteries today have a number of unsolved problems, including high cost, heat output, limited lifespans, and the toxic or corrosive materials used in their manufacture. But two main issues limit the functionality of modern batteries, Prieto said: low energy density and low power density. Low energy density means that a conventional smartphone battery can’t hold enough energy in a small enough volume to power the phone for much longer than one or two days, while low power density means the battery will take hours to recharge, instead of minutes. Prieto’s group has tackled many of these challenges by making of list of desired properties for each of the main battery components. The team then developed one component at a time – starting with a copper foam structure the team purchased to serve as the current collector on the anode side of the battery. “Foam is relatively easy to manufacture,” says Prieto. It also has a 3D structure that increases the surface area of the electrodes and brings them closer together, which in turn increases the power density of the battery. In terms of energy density, the foam should also get more bang for the buck. The intricate 3D structures utilize the electrode material more efficiently than a flat surface. 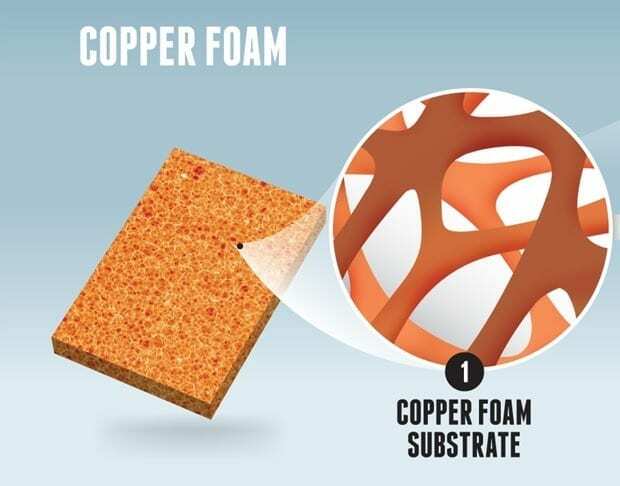 On top of the copper foam, the researchers electroplate the anode, made from a material called copper antimonide. In a kind of bootstrap battery building, the anode then serves as an electrode for an electrochemical polymerization reaction that deposits the battery’s solid electrolyte. Finally, the team fills the space within the foam with a slurry that is dried to form the cathode. An aluminum mesh structure collects the current on the cathode side. The electroplating equipment the team uses is inexpensive compared to the equipment needed to make other types of batteries. Prieto estimates the cost to manufacture the copper foam batteries will be about half that of conventional lithium ion batteries made in China. The team also calculates that the foam battery should store the same amount of energy as conventional batteries in two-thirds the volume, charge five to ten times faster, and last up to ten times longer. April 18, 2019 - 50 useful Mother's Day gifts you can at Target Business InsiderMother's Day is right around the corner. If you're in need of some affordable ideas for what to give Mom this year, we've got you covered. October 26, 2015 - New Foam Batteries Promise Fast Charging, Higher Capacity MIT Technology ReviewAffordable, lightweight, and versatile, batteries made of porous materials could soon transform energy storage. June 18, 2017 - Your smartphone battery is going to get way better if Prieto can turn its 3-D battery into a commercial reality The Denver PostStartup Prieto Battery is building a 3D battery for smartphones.